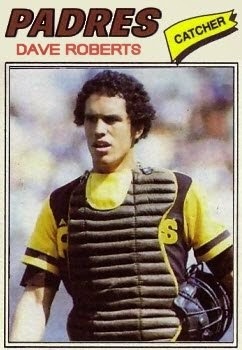 For all the bicentennial bunting used on its 1976 cards (#5 Dave Roberts profile), Caruso returned to a more familiar black and white in 1977 for Hawaii's PCL set. These days, a good designer with a computer can match Topps stroke for stroke in visual presentation, but I suspect 1970s tech meant a real price difference for any kind of color, so most teams opted for bare-bones photos. WhatTheFont identifies Aurora Bold Condensed as a close match, which looks like this. Close, but no lei, as there's a lot more curve happening in Aurora. The card font might be completely custom work, but add a note if you can ID it for sure! 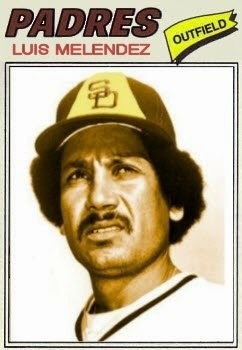 Luis Melendez and that excellent mustache were on the downslope of an MLB career; his 1977 big league service time was so slight that this custom version's the only card you'll find, courtesy the Padres page of blog 1977 Baseball Cards Update. That blog's San Diego page also sports a 1977 version of my 1976 Hawaii Islanders #5 type card, none other than Dave Roberts. His feature page ("Mr. Roberts?") goes into some depth on his career path, which started high as 1972's #1 pick, continued well in 1973...followed by a long slide down from there. One of that blog's readers noted Roberts made a rather sloppy play to end the 1981 Divisional Series as a Houston pinch-hitter. I've linked the game broadcast above and Roberts' at-bat starts at 1:58:10 and the broadcasters give a slo-mo breakdown a couple minutes later, in case you want to know why you should check for dropped third strikes. Value: This #5 single currently lists high on eBay ($8 + shipping), but Caruso team sets sell for a more reasonable $15-25, with no stars in its checklist to chase. That says as much about the quality of San Diego's farm system as anything, unfortunately. Fakes / reprints: Haven't seen any fake Caruso minor league cards in the marketplace.